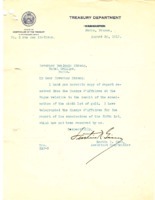 Date is exactly "1919 August 2"
Informing Skinner that the subject of mob violence which he raised in a letter to the President falls within the jurisdiction of the states. Lurtin R. Ginn to Benjamin Strong Jr.
Lurtin R. Ginn sends Benjamin Strong Jr. a report on the examination of the ninth lot of a gold shipment. Benjamin Strong Jr. writes Russell C. Leffginwell regarding an international currency shipment.